Today I'm thrilled to be able to offer up another great giveaway. 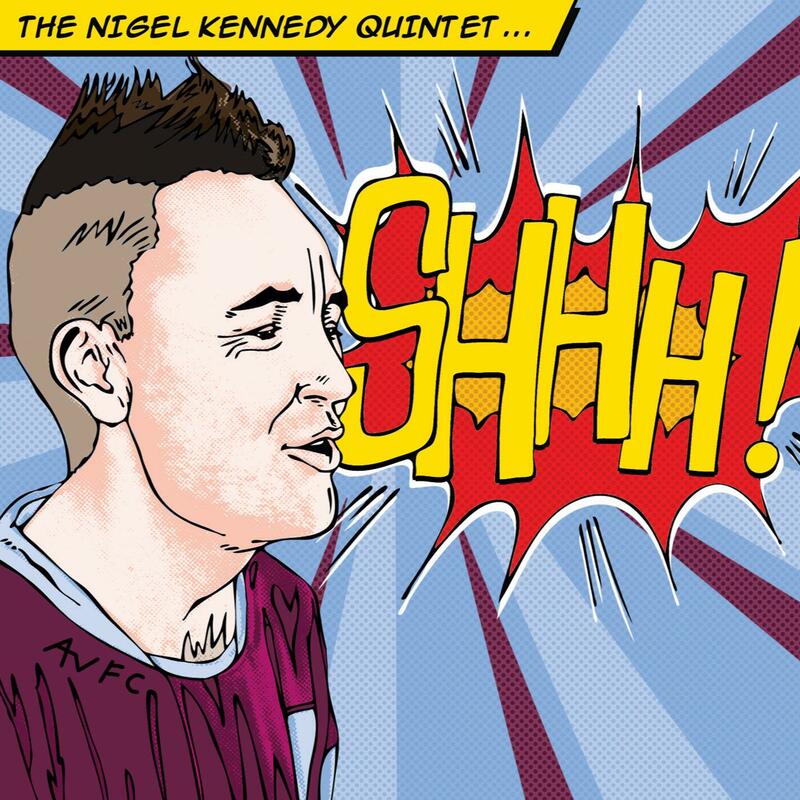 This time I have two copies of the new CD by The Nigel Kennedy Quintet called SHHH! I've been listening to the review copy I got from Natalie at HeadStreamPR, and it really grows on you! The second track, River Man, was written by Nick Drake, and features vocals by none other than Boy George. I would have never guessed that the somewhat gravelly-voiced singer was The Boy, but he does a fantastic job! I have two copies of the CD to giveaway. It's going to be released in the UK on May 10 and in the US on June 8. So you'll get your copy before anyone else has it! Be the envy of all your friends! To enter, just leave me a comment and a way to contact you. Make sure your email address is in your post or visible on your profile. This contest is open to anyone in the US or Canada. The first entry drawn will receive the brand-spanking new CD, and the second will receive my gently-used review copy! :) Please leave your comments by April 28 so that I can choose the winners on April 29. EMI Classics is proud to present Shhh! the latest Nigel Kennedy Quintet album, which is released on 10 May 2010. With a special guest appearance by Boy George, the album confirms the maverick status and omnivorous musical taste of one of Britain's finest and most unpredictable musicians. Following his 2008 excursion into the self-penned tracks of the NKQ’s A Very Nice Album, Kennedy's latest collection reveals an even more eclectic character. It was recorded at one of rock's fabled residential country studios, Rockfield in South Wales with the Polish musicians which make up the NKQ. Collaborating on one of the album's outstanding and most surprising tracks is Boy George, an old mate and near neighbour of Kennedy's in North West London who shares his passion for the songs of the late Nick Drake. George's delicate vocal on River Man points to another new direction for Kennedy's music – a gentle chamber pop which brings out the understated lyrical tone in his violin playing. The other songs on Shhh! are all Kennedy originals, ranging from the long instrumental opener, Transfiguration - reminiscent of the fusion-ary flights of John McLaughlin's Mahavishnu Orchestra - to the dirty funk rock outro Oy! The moods along the way vary from the sparse and desolate calm of The Empty Bottle to the uplifting Silver Lining. Throughout the Bank Holiday weekend of 29 -31 May, Nigel Kennedy will also be bringing Poland to the Southbank Centre. The weekend extravaganza includes a feast of music, from jazz and klezmer to classical, performed by Kennedy himself and a number of Polish musicians. The weekend features the UK debut performance of Kennedy’s own orchestra, the Orchestra of Life; Nigel Kennedy’s Chopin Super Group, which celebrates the music of Chopin in a fresh and original way; and Kennedy’s exciting World Cup Project, where Kennedy and guests perform a soundtrack to a screening of the 1973 World Cup qualifying match between Poland and England. The Nigel Kennedy Quintet performs music from their new album and each night of the festival features late-night informal jam sessions. There are free activities across the weekend, with breakdancers, Polish food and drink, and workshops. For more information please visit www.southbankcentre.co.uk. You can pre-order Shhh! now at Amazon and watch a clip about the album here! Judging by the audio clips on the EMI mini site, this is a Kennedy album nobody's going to want to be without ! I too couldn't believe it was Boy George providing the vocals for River Man............but what an inspired choice he's turned out to be ! I'd like to win this! Please enter me in the giveaway. Interesting cd, I'd like to check it out. Terrific sound this group has -- love the songwriting of Nick Drake, and Boy George's re-emergence is a nice surprise. Thanks for introducing me to some good new music - and for the chance to win a copy of the CD as well! I would love to listen to this, thanks! I love to hear new stuff. Thanks for the contest.